Friday night, the Sonoma State Seawolves traveled to their rival’s court to take on the Chico State Wildcats in a conference matchup. At 7:30 p.m., they tipped off and within the first 12 seconds of the game, the Wolves were leading after a layup from senior Justin Herold; who has been very productive for Sonoma all year. That lead wouldn’t last long, as the Wildcats would go on a seven-point run. It was a close knit game through the first half, as neither team led by double digits until there was only 11 seconds left in the game. Both teams shot well, but ultimately, Chico triumphed in the end, taking the victory 76-68. Sonoma showed good balance throughout their team, as four players scored double-digit points. The Seawolves were led by a strong performance from Justin Herold, who contributed 15 points, an assist, a block, and two steals. Senior Jason Walter added 14 points and an assist. Sophomore guard James Davis was a big part of the Wolves’ offense, with 12 points, two assists, a steal, and went 6-7 from the free throw line. Sterling Arterberry also added 11 points, an assist, and a steal. The Wildcats had four double-digit scorers of their own. Jordan Semple had a huge offensive performance, contributing 25 points (1 short of his career high), three assists, three blocks, and two steals. Amir Carraway added 17 points, a block, and three steals. Giordano Estrada scored 10 points and two assists. Rashad Parker also added 10 points, three assists, and two steals. Fouls played a big role in this game. The key to the Wildcats’ victory was their clutch shooting from the free throw line. They scored a game-changing 25 points from the charity line. They went 25-29 at the line (86.2 percent). Saturday night, the Wolves took a trip to Turlock to face Cal State Stanislaus. The Warriors attempted to keep their undefeated record at home in tact. Stanislaus was in the driver’s seat the entire game. They scored the first four points of the game, and never relinquished the lead. They led by at least 14 for the final five minutes of the game, until they would ultimately end up on top 69-47. Not a huge offensive game for the Seawolves. Justin Herold led the Seawolves with 14 points, a block, and a steal. David Ahern put up 13 points of his own. James Davis was a big part of the offense with four points, four assists, and two steals. Clinton Tremelling led all scoring with 16 points and three assists, sinking four three point shots. The biggest performer for the Warriors was senior center Marcus Bell who contributed 15 points, two assists, five blocks, and two steals. Rob Walters also added 11 points and an assist. Sam Marcus displayed selfless play, contributing seven assists. The story behind the final score was the Wolves shooting. They scored a season low 47 points. They shot a dismal 34 percent for all shots, 25 percent from beyond the arc, and 54.5 percent from the free throw line. Compared to the Warriors 46.9 percent, 46.7 percent, and 80 percent numbers. 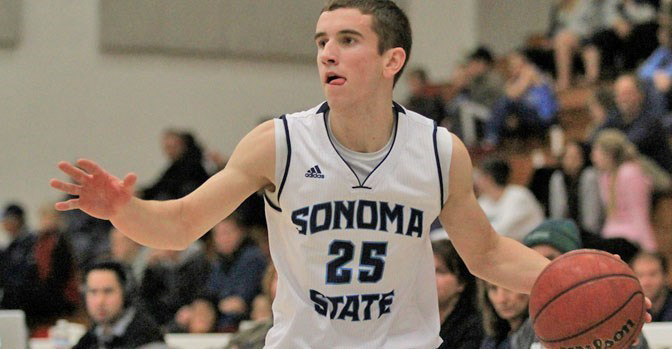 The Sonoma State Seawolves fall to 2-12 in conference play, and 3-15 overall, and remain in last place. While the Warriors improve to 9-5 in conference play, and 13-5 overall while maintaining their flawless 10-0 record at home in Turlock. This Friday, Cal State Los Angeles comes to the Wolves Den. Tipoff is at 7:30 p.m.